The latest figures show there have been 4,024 confirmed or suspected deaths in the worst-affected West African nations of Guinea, Liberia and Sierra Leone. Eight deaths are linked to the haemorrhagic fever in Nigeria and one in the US. In total, there have been 8,399 confirmed or suspected cases, mostly in West Africa. The news comes as Liberian lawmakers refused to grant the president additional powers to deal with the Ebola crisis. One parliamentarian, Bhofal Chambers, warned that creeping extra powers could turn Liberia into a "police state". The UN says more than 233 health workers working in West Africa have now died in the outbreak, the world's deadliest to date. A nurse in Spain is being treated for the virus after becoming infected from an Ebola patient who had been repatriated from Liberia - the country most badly hit by the disease with 2,316 confirmed or suspected deaths. 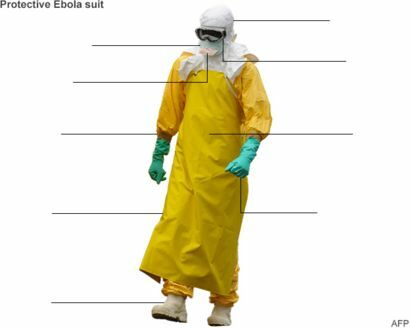 Note: figures have occasionally been revised down as suspected or probable cases are found to be unrelated to Ebola. They do not include one death in the US recorded on 8 October. Teresa Romero is said to be gravely ill but stable, and is being treated in a hospital in Madrid. Spanish Prime Minister Mariano Rajoy on Friday set up a special committee to deal with the impact of Europe's first case of Ebola. He admitted that the situation was "complex and difficult", but stressed that the government had a clear plan for what needed to be done. He was speaking as seven more people in Spain were being monitored in hospital for suspected Ebola. They include two hairdressers who came into contact with Ms Romero. Meanwhile, a senior health official told the BBC that leading global experts in the field had not anticipated the scale of the Ebola outbreak. Chris Dye from the WHO said the international response was helping, and the important thing now was to look forward. "We've asked for a response of about $1bn (£618m); so far we have around $300m (£185m) with more being pledged, so a bit less than half of what we need but it's climbing quickly all the time," he said. In April, the medical charity Medecins Sans Frontieres (MSF) warned of the potential spread of the virus, but at the time the WHO played down the claims, saying that Ebola was neither an epidemic, nor was it unprecedented. On Friday MSF reported a sharp increase of Ebola cases in the Guinean capital, Conakry, dashing hopes that the disease was being stabilised there. Meanwhile in Mali, an experimental serum is being tested on volunteer health workers. The trial spans several countries, and the results will be sent to experts to determine whether it can protect against Ebola.